Just a couple weeks after the Motorcycle Rally we celebrated Thanksgiving or “Turkey Day” as many locals call it. Every year we get to celebrate it at Lannette and Wayne’s house. We all share lots of food and have made it a tradition to wear our pijamas that day, why? Well, you have to have comfy clothes to be able to keep eating all that turkey, mashed potatoes and, of course, dessert. Thanksgiving is always a very busy family weekend in Rocky Point so we hope all of you had a great Thanksgiving and are putting up your holiday decorations, even though it seems to have started before Halloween this year. 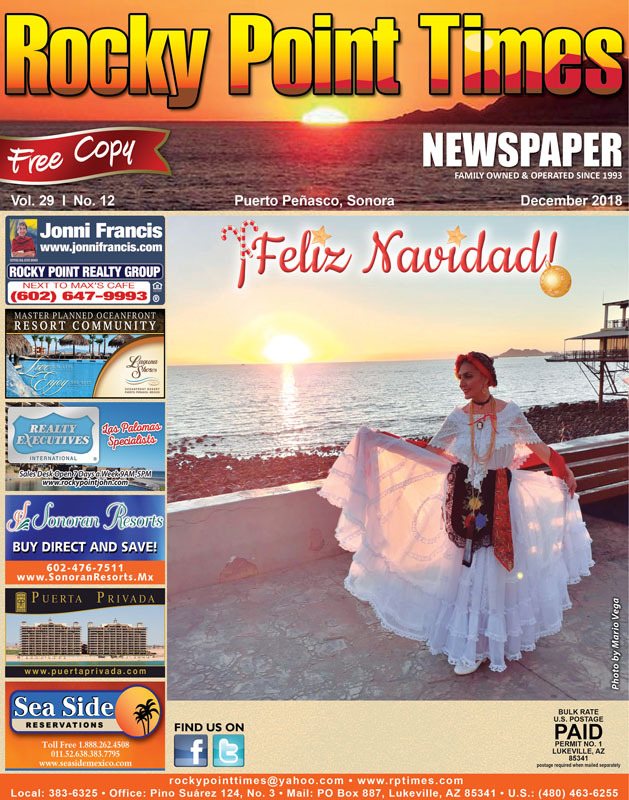 It feels like it will be a cold December too, and not just in Rocky Point, but the whole country will have many cold fronts, or at least that’s what the news is saying. Our posadas will be a bit colder this year, but that won’t stop any of us from celebrating and, of course, lots of drinking. About 5 years ago, Alicia wrote about a posada we had at the Sonoran Sky when I used to work there as a security guard and I will like to give Marcos Marmolejo a big thank you for the opportunity to work for the resort when I came to live in Rocky Point. Posada is what we call our Christmas parties and they are part of our tradition. Every company and employer holds a Posada for their workers complete with food, drinks, music and merriment. They often give out prizes, rewards, and have big raffles and some workers have a gift exchange among themselves. I think one of the biggest posadas is held by Sea Side Reservations, and all of their workers receive at least one gift. For us, it’s still a happy time to celebrate, but it has been hard without Sandy. All of you that met her know how happy she always was and how she loved planning out big meals and celebrations. I can’t find the exact words to use, but all I can say is we have missed her very much and she is always in our hearts and we are happy to have her there as we celebrate the holidays. And speaking of Sandy, you all know she used to live out at the Ranchito and one of the things Sandy always wished for was electric at the Ranchito. Wouldn’t you know it, and as soon as she leaves us, it happens! Club Lomas Campestres now has electric. Phase I has been completed and the first two streets have electric lines, but we have no idea when Phase II will be done. The first phase took about 15 years and we hope phase two doesn’t take that long. Another think I want to mention is the El Golfo Run. We have gotten emails, calls and messages about when the next one will be. To be sincere we don’t know yet. For those of you who don’t know what it is, it’s a run from Rocky Point to El Golfo that was organized by Tom and Sandy back in the day. We did it two times a year for over 20 years. When Tom left us, Sandy did a run in his name to celebrate his life, she hired Chino and we had carne asada tacos and lots of drinks and it was a big party (and she kept the Run going for 4 years). Now that she is gone we are trying to see if it’s possible to hold one to celebrate her life too. We know many of her friends would like to assist and a lot of them would help and lead the Run. We have the support from Casey and Beverly Luna, as well as Pat Maciulla and other friends. We will keep everyone posted if something is decided or if the run is possible for the month of May of next year. It’s been a very, very hard year and we are all still trying to adjust to losing Sandy. Lots of changes and hopefully we’ll be in better spirits come 2019. A lot of you probably now know that Chef Tony Mena closed his restaurant, Tony’s Café. He decided to take a break from the restaurant, but still has his catering service and Chef For Hire business. He is searching for a place to open the restaurant in the near future, but for now you can hire him and have him cook for you or your party at your place, or his, any day of the week. His cell phone number is (638) 107-5752. Don’t forget to visit the Mermaids Market at the Shrimp Plaza and take a look at the remodels that have been done, it looks great. The plaza really did need some TLC. You will be able to find lots of great Christmas gifts at the Market and at all the stores around town and on Rodeo Drive. 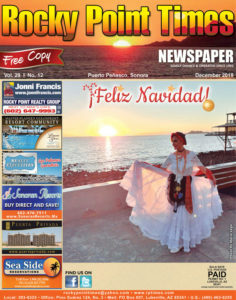 And, of course, don’t forget about everyone’s favorite gift…a subscription to the Rocky Point Times! And remember that the Cholla Bay Christmas parade will be on December 8th around 6pm. May you all have a wonderful and blessed Christmas and Happy Holidays to you all. Stay warm! Have a fantastic start to the New Year and we’ll see you in 2019!